Making the world a better place, one equation at a time. Future Freshmen placement test info. This course is designed to prepare students to take the AP Statistics Exam. Students may receive college credit through successful completion of the AP Statistics Exam. 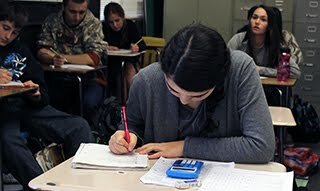 AP statistics is an advanced mathematics course in which students will study and analyze surveys and data. This course is designed to prepare students to take the AP Statistics Exam. Students will receive college credit through successful completion of the AP Statistics Exam. Integrated Math 1 is the first course in which most students will be enrolled. The course covers key algebra topics of linear and exponential functions, and also focuses on geometric transformations and congruence. Successful completion of the majority of the course material will give the student credit for Integrated Math 1. Students who do not achieve sufficient knowledge and skills may be given credit for Math A and will be allowed to repeat Integrated Math 1. The mathematics department recommends all students pass Integrated Math 1 with a “C” or better before enrolling in Integrated Math 2. Pythagorean relationships, right triangle trigonometry, and circles will be directly connected with the students knowledge of quadratics. Integrated Math 3 is the third course in a three course college preparatory series. Students pull together and apply the accumulation of learning that they have from their previous courses. The students will look at addition models of mathematics that help to build background for advanced math and science courses. integrals. This is a college level course where students may receive college credit through the successful completion of the AP calculus exam. This course corresponds to the first semester of college calculus. techniques of integration. This is a college level course equivalent to a second semester college calculus course. Students can receive the equivalent of up to two semesters of college credit with the completion of this course, and succesfflully passing the AP exam.